As far as credentials go, they don't get any better than Ladbrokes Casino. 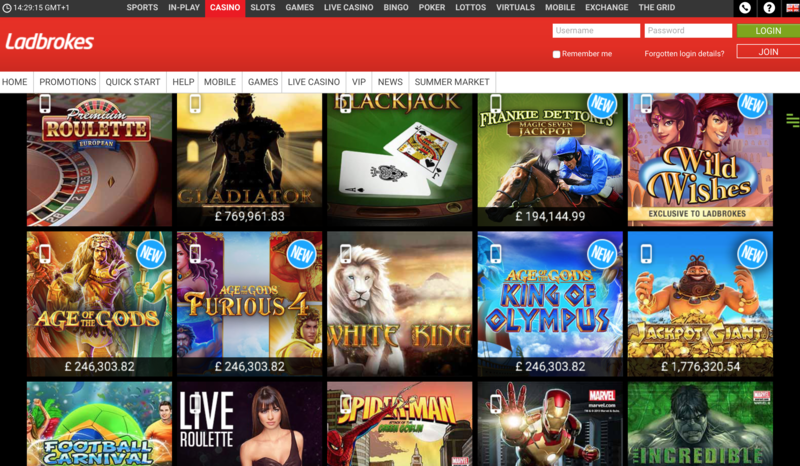 Ladbrokes is one of the oldest names in betting and gaming, having been established in 1886. This vast company trades on the London Stock Exchange, and the casino has almost 1,000,000 active members. Almost as vast as the Ladbroke's empire is the variety of games – this site boasts around 550 individual titles including blackjack, roulette, multiplayer games, and slots. There is also a Live Dealer Casino where beautiful people take your bets on blackjack, baccarat, and roulette. Ladbrokes are at the forefront of the mobile gaming revolution too and offer generous bonuses to those who play on a smartphone. Promotions are kept fresh and juicy, with weekly bonuses on selected games, so it pays to look under the PROMOTIONS part of the website each time you log on. Oh, and if you fancy a trip to the Grand Prix, ballet, or Premiership football matches, then aim for the Ladbrokes VIP club. As far as safety, security, choice and bonuses go, coupled with that illustrious history, and it's easy to see why Ladbrokes is a safe bet. And now we will take a deeper look at what makes this outstanding casino so spectacular. Download the software to get access to over 540 games including roulette, blackjack, table games, three reel online slots, five reel online slots, progressive jackpot games, video poker, scratchcards, variety games, and UK pub slots. Bonuses correct at time of press. Get free spins every weekend on selected games. It's also worth noting the varieties of slot tournaments. There were eight in total, each lasting for a different duration, with different prizes. For example, in Monthly Monsters, play for a share of 25K. It plays on the last Monday of the month, and the top 25 winners win 1K each. Ladbrokes operates a fairly standard VIP club, until you get to the upper levels. Once you hit that top rung, you will be treated to the best in hospitality including visits to premiership football games, polo -- even the ballet and Grand Prix. Downloading is highly recommended here – it takes a matter of seconds. Once it is complete, you get access to the full suite of 550 games. Software comes from several different sources, including Ash Gaming, Blueprint Entertainment UK Ltd.,CWC Gaming, Evolution Gaming Limited, Microgaming Systems Ltd. The site is bedecked in the red and white corporate colours of Ladbrokes, but it's still fairly classy, without been stuffy or tacky. The credentials of Ladbrokes stack up like chips in a lucky roulette game. They have an annual revenue of £980.3 million, and in 2011, the profit was £193.5 million. Ladbrokes is licensed by the Government of Gibraltar, and regulated by the Gibraltar Gambling Commissioner. Visa, MasterCard, Maestro, Switch, Solo, PayPal Casino Sites, Neteller, Click and Buy, Ukash, Bank Transfer, Western Union, Skrill, InstaDebit, and Ladbrokes Shops.